feeling super giddy this week, so feeling a little random and my thoughts scattered. i drove around this afternoon and my mind went from shop orders to weekend plans to peanut butter oreos (then again, food interrupting my thoughts is not abnormal). this has also been a week full of good news and will be sharing with you super soon (woohoo - happy dance!). and oh, loooook, i'm not bundled up in layers of scarves, gloves and coat like i would be if i was back in the Midwest - the South Carolina sunshine and temperatures might be having an effect on me. and since we are on the random roll, i received this sweet little package from my friend, Amy! my sister and i are obsessed with mustaches and were both giddy over these hair clips. and come on, aren't the names just adorbs?! 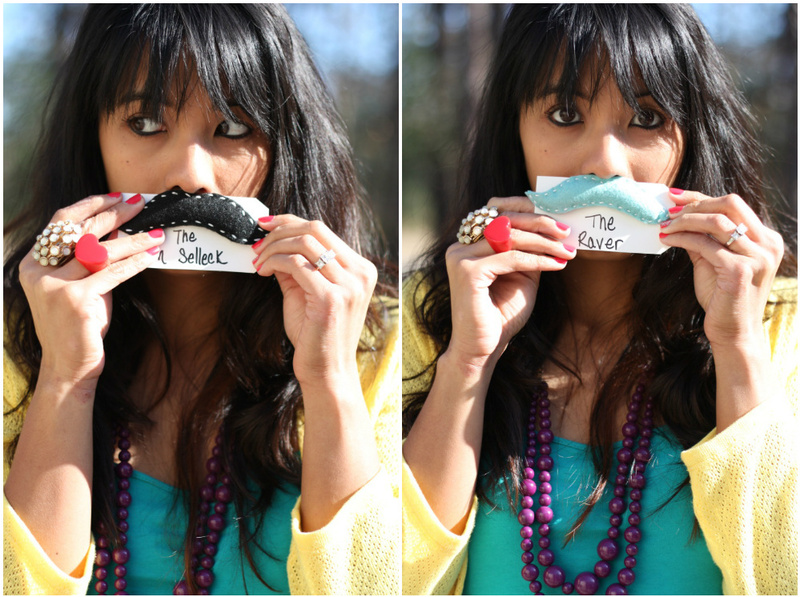 i love that she named each of them - the tom selleck, the raver - haaaa-larious! so that's some random awesomeness for you good people. let's full blast some Katy Perry and get this weekend party started. p.s. did ya see this sweet giveaway and this one, too?! oh my goshbubbles that's a mustache hairclip? i'm so in heaven right now. so adorbs! love the colors of your outfit. and the shooooooes! giddy announcement?! sound spicy!! can't wait! Announcement?! Exciting! You look adorable & summery today. So jealous you're out in SANDALS!! The weather here has been so hormonal- one second it's gorgeous, the next it's freezing! The Tom Selleck?! PRICELESS. I love it. :) And I second the peanut butter oreos thing. SO GOOD. I love that teal tank, have the same one from f21 too! I like how you mix and match colors. I need to be more daring! Can't wait to hear your good news! Happy Dance for sure! but for you, i'll do it for just the mention of oreos and mustaches. love those hariclips and your heart shaped ring. both so adorable. The party will take place on artandloveandme.blogspot.com every third thursday of the month which was also yesterday. I would love to welcome all of you who are interested and am excited to see your art. so pretty as usual! i love your sense of color! I love the raver, its my fave. It looks ballin' against my dark hair. also? you're adorbs. tis all. It's a bad sign when it's 10:00am on a Friday and I'm already on blogs at work, but I saw mustache hair clips on bloglovin' and that was that. Bring on the weekend! The Tom Selleck!?! I need! Adorable. Those mustache clips?? You're too cute! I can't wait for the announcement!! You're so gosh darn cute. Mhm peanut butter oreos. SO good! The sweet little hair clips are too cute! Ahahahaha! Those mustaches are so awesome! Haha you're cute! 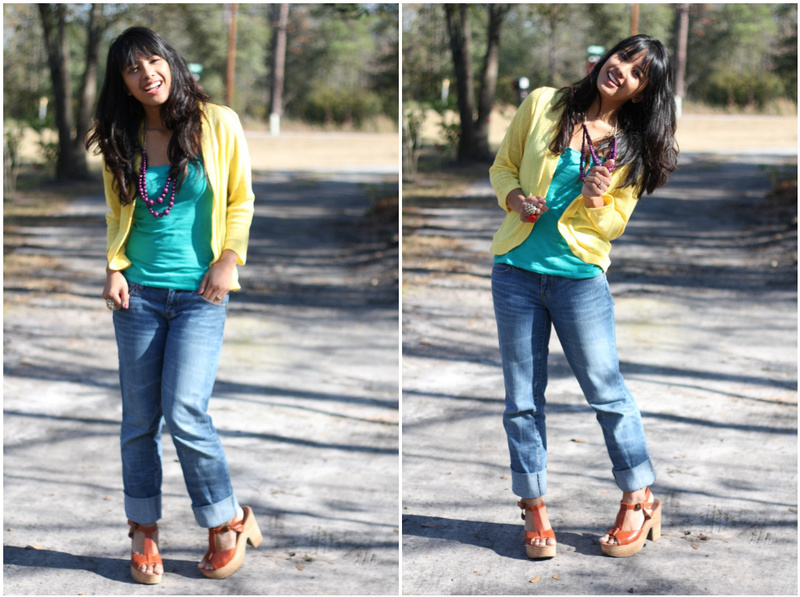 Loving that cardigan! those hair pretties are so great! I hope you have a great weekend! Those are pretty awesome. Love Amy and her sense of humor! Super cute post! Love it. And, have a great weekend. those staches are the best! love your outfit! it looks soo spring like!! Waouh !! Love your wedges !! Wonderful !! I love the bright colors you look so cute girl! You look amazing, I'm really like your jacket!!! Cutie!! You are even more adorbs with you lip jacket hair clip. The Selleck is cracking.me.up.